We have two main kennels – all enquiries regarding cash or materials donations, or adopting Dobes can be made to one of our main kennels, or one of our area officers. If you have a Dobermann and need to give it up for adoption then contact our main kennels only, by phone. For all enquires regarding Sponsadobe and merchandise please contact. 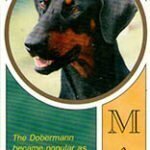 Want to adopt or foster a Dobe? Please fill out our online application form. We would love to hear from you! Please fill out this form as accurately as you can. 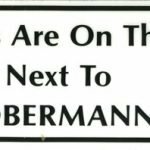 All information will be dealt with confidentially, and will only be used by members and representatives of Dobermann Rescue Ltd. 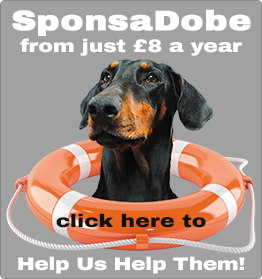 If you have rehomed or fostered a Dobe, we'de love to hear your story. You can email us your story, if you prefer, or use this form. We will keep your personal details, above, private, so please include a preferred identity below (e.g. Brian from Coventry) for inclusion with the article. You can paste your story into the box above. please don't include any personal details here if you don't want to share them in your story.